Are you planning to install a new hardwood floor in your home to transform a bedroom, living room, or other space from drab to fab? Among the many crucial aspects of your new floor to consider is whether you’ll want to have plank flooring or tongue and groove flooring installed. While both varieties of hardwood flooring feature durability and the beauty of natural wood as pluses, each flooring type has its own unique qualities. One of the main advantages of tongue and groove flooring is that the final product fits together snugly, and will make the wood floor look seamless (unlike traditional plank flooring that requires nails to be hammered into each plank to connect them). The “tongue” part of tongue and groove usually sticks out at one end, and fits exactly into another board’s “groove.” Use a strong adhesive specifically manufactured for wood flooring to ensure that the matching parts will not develop small gaps as a result of foot traffic and other stresses. Plank flooring, on the other hand, provides more opportunities to get your DIY muscles flexing, and it’s also the way to go if you want a “handmade” look for your floor. You can also use reclaimed or oddly sized wood parts for plank flooring, instead of just throwing those “useless” pieces on the scrap pile. However, this method does require a bit more know-how than installation of tongue and groove wood flooring: among other things, you should be familiar with the basics of hammering, nailing, cutting wood, and (of course) home improvement safety. Use wood glue and/or putty (preferably in the same shade as the wood flooring) to cover any small gaps between the floor’s new planks or nail holes; it is crucial to check for these gaps before you sand and seal the plank floor, so that potential tripping hazards can be avoided. Regardless of whether you use plank or tongue and groove hardwood for your new floor, you’ll need to sand and seal the wood as the final step in the process. Going over your floor with a floor-sanding machine will even out any imperfections in the wood; after this step, you can also stain the wood if you so desire. Seal the wood floor with a polyurethane sealant to protect it from daily wear and tear due to foot traffic, furniture moving, and so on. No matter which type of hardwood style you’ve chosen, this helps ensure that your beautiful new flooring will remain spectacular for years (or even decades) to come. 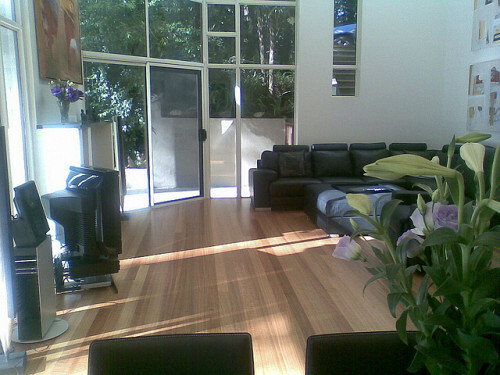 For professional hardwood floor installation, find a reliable flooring contractor near you.